Have you ever run into a friend from your past in an unexpected place? Maybe you went to an amusement park or concert and saw someone you went to high school with and one of you commented about what a small world it is. Try this one on for size. 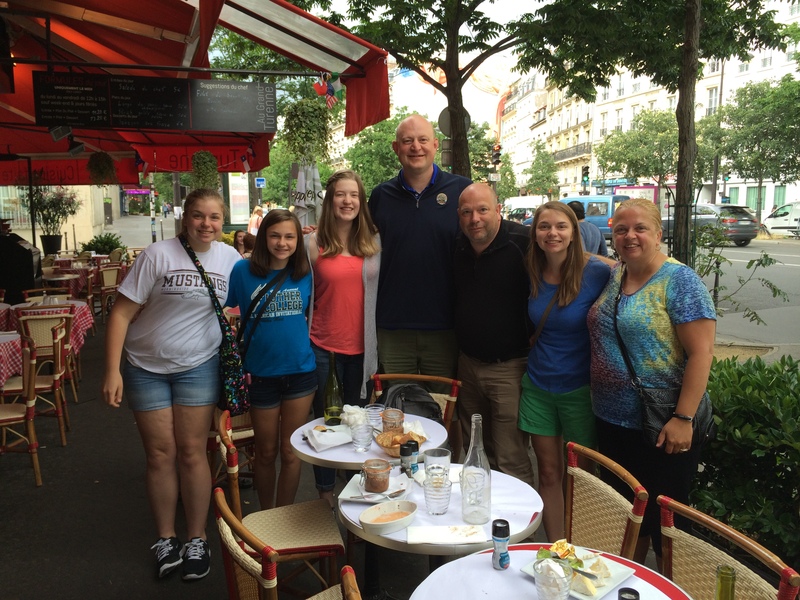 Walking from our hotel in a random neighborhood in Paris, France, my daughter and I ran into some friends that we went to church with nine years ago when we were living in Mason City, Iowa. Stunned doesn’t begin to describe what we were all feeling after I greeted them from about fifteen feet away by saying loudly, “I go all the way to Paris and who do I see but the Muyskens family?”. After all five of them (parents and three daughters) whirled their heads to see who just called their name out in Paris, we exchanged hugs and excited “What are you doing here?” silliness. Duh! We’re all on vacation. Yet, here we both were. I’d kept in touch with Dennis and Susan over the last nine years since we last lived in Iowa. The last time I saw them was in 2009, when I took my oldest went back for a weekend with one of her best friends there. While we remained on friendly terms (exchanged Christmas letters/photos) ours was more of a Facebook friendship where we kind of kept in touch but that was about it. And then, this. A chance meeting in Paris. They had literally just arrived that morning after taking an overnight direct flight from Minneapolis, Minnesota. They were on their first outing from their hotel, trying to find the nearby Metro stop. Only, they had gone the wrong direction (toward us). Likewise, my daughter and I had just found our hotel after taking the overnight train to Paris from Milan. After our showers we decided that we were hungry and the hotel clerk said that there were restaurants to the left or to the right from the hotel. We opted to go to the right since that was the direction of the Metro stop we would need later to go to the Eiffel Tower. It was at the corner of that street, a block from our hotel, that we chanced upon our friends. Since we were all hungry we decided to grab lunch together at the cafe which was across the street. What followed was a lot of head shaking and What are the odds?! moments. It was great to see my friends again. It’s amazing how quickly kids grow up when the last time you saw them was nine years prior. The Muyskens girls were just finishing 1st, 4th and 8th grades back in 2005 when we moved. Now the oldest is a college graduate, looking forward to teaching art in the fall. The next daughter is in college, a double major (bio and chem) looking at med school. The youngest is a junior in high school. Crazy! Of course, it goes both ways. Susan was my daughter E’s preschool teacher for two years. Of course, E, at age 14, didn’t realize that this was the famous Mrs. Muyskens from preschool and was even more shocked when I told her that fact. Since we’d had so much fun catching up at lunch we decided to accept their kind invitation to tag along on their trip to the Eiffel Tower. (It’s what we’d planned to do anyhow, but better with friends!) I think it was especially nice for my daughter to be able to have this fun time with three other girls roughly her age instead of just me. We get along well but I’m sure she enjoyed the time with other teens. At any rate, the tower was huge. Bigger in real life that I thought it would be. So interesting to finally see such an iconic European structure. We had hoped to go to the top but the lines were about 3 hours long. No thanks! But walking underneath it was also pretty cool. Thinking about how it was built and all the iron needed to do it. What an engineering marvel. After a delicious ice cream/sorbet break and some cartwheels and bridges in front of the tower we meandered found some other impressive buildings – palaces and cathedrals and such – and just enjoyed our unexpected afternoon together. Seriously. If either of us had left our hotels 30 seconds sooner or later we wouldn’t have seen one another! At about 5:30 local time, which was 10:30 am Minnesota time, we decided to have dinner together before heading back to our respective hotels, as some of the Muyskens family were starting to feel the effects of jet-lag. After dinner we navigated through the Metro to the stop near our hotels. When we got to our parting spot we stopped to say good bye. Only this time my daughter had made three new friends so the “kids” also participated in the good-bye hugs. Being the clown that I am and not wanting to dwell in the sadness of the farewell moment too long, I spontaneously said with all the dramatic flair I could muster (which isn’t much, I might add), “We’ll always have Paris!“. It received the desired reaction and we left. 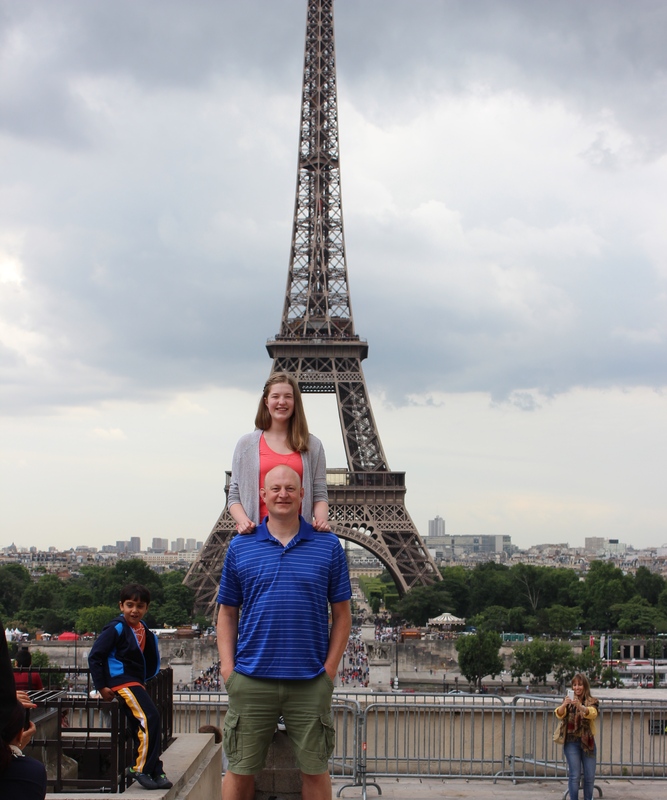 Our separate European vacations forever entwined by a chance encounter in the City of Light. Au revoir!